If you’re staying in Prague then you probably won’t be using buses, unless you are staying in some obscure suburbs. Also buses are not allowed in the city centre as they produce noxious fumes and the streets are too narrow, so they transport people from the suburbs to tram and metro stops outside the centre. Tickets are available from all the usual agents (if you have change you can buy tickets directly from driver at extra charge). Throughout the night there are 12 buses which go to the outer areas not sewed by the tram and metro system. Night-time service is mainly provided by bus numbers 502 to 514 and 601 to 603. Bus schedules are located at individual stops. Regular buses operate from 4.30 a.m. – 12 p.m. Daytime buses run from 4:30 a.m. till midnight in 6-8 min. intervals in peak hours, 10-20 min. intervals in the off hours, and 15-30 min. intervals on weekends. Night buses (numbers 501-512) run from 00:30 a.m. till 4:30 a.m. in a 40 min. intervals. Basic fare: 26 CZK. Tickets purchased from driver: 30 CZK. For Bus departure and arrival information dial Tel. 900919041 or Tel. 224 210 221 (for international departures). You can also visit online timetable with prices at idos. If you are travelling outside Prague then a bus might be quite a good option, as they are usually cheaper than travelling by train. Most services are operated by CSAD and Student Agency. 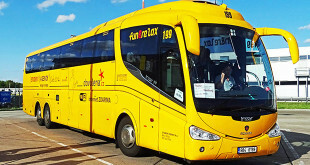 Prague is well served by Bohemia Euroexpress International, Eurolines, GTS International, Student Agency, and Capital Express buses, all of which reach numerous EU destinations. Most international buses are equipped with cushier seats, magazines, and even entertainment and wi-fi internet. You can buy your tickets in advance, though most operators allow you also to purchase directly from the driver. Most international connections terminate in Prague at the Florenc station. – Na Knížecí – Praha 5, Nadrazni (Metro B-line, Andel). Serves domestic routes. 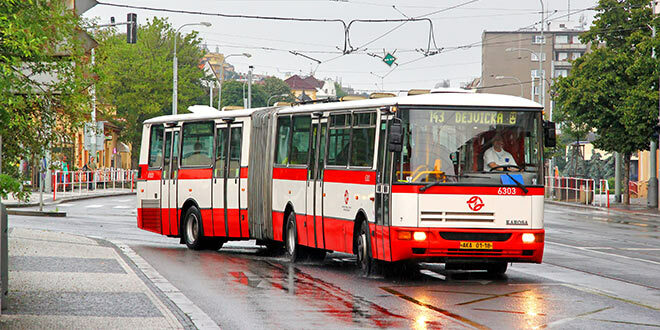 Special bus lines 1 and 3 providing transport for disabled persons in wheelchairs connect the suburbs Černý Most, Jižní Město, Nové Butovice and Řepy with the centre of Prague (Metro station Florenc) where the change of lines is possible. These lines are in service during the working days only. You can book a ticket on any of the 3000 domestic and international services at www.amsbus.cz. Tickets can then be picked up at any AMS office. Huh, I hate trams and metros. I’d rather walk than use public transport really. It’s disgusting. Of it buses are the best as they’re faster than trams and better at breaking and also you don’t feel like in an elevator.